Home BLADE Show Beware BLADE Show Hotel Scammers! Beware BLADE Show Hotel Scammers! It’s that time of year again, time when Internet, telephone and other scammers misrepresent themselves as so-called “official” agents of the BLADE Show in booking hotel rooms for the world’s biggest and most important knife event. Beware BLADE Show hotel scammers! To find out how to both identify such unauthorized charlatans and protect yourself from them, read on. Slated for June 2-4 at the Cobb Galleria Centre in Atlanta, the 2017 BLADE Show will attract knife enthusiasts from all over the world, knife enthusiasts unscrupulous scammers will try to exploit. However, if you follow a few easy guidelines, you can foil the scammers and get the best lodging for the show your hard-earned dollars can buy. The BLADE Show has designated EventSphere as the ONLY housing provider for the 2017 BLADE Show. If it’s anyone but EventSphere, delete. 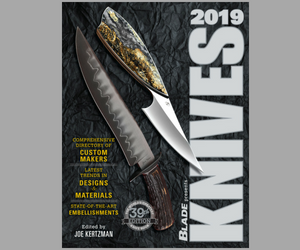 There are fraudulent companies and organizations that will try and present themselves as official partners of the BLADE Show and offer you a potential room that might not be guaranteed or available. When booking with Eventsphere use the online reservation link or call 855-547-8429 and expect to receive an immediate confirmation e-mail. PLEASE NOTE: EventSphere will NEVER call you directly to book a reservation!!!!!!! •Someone from BLADE Show management told EventSphere to contact you. Should you be contacted by someone other than EventSphere or have any question concerning what you may suspect is a fraudulent booking attempt, please let us know by emailing blade@eventsphere.com. For more information on the 2017 BLADE Show, the 4th Annual BLADE University and more, stay tuned to this space or visit BLADE Show. Track ’em down, set ’em up, and take ’em out- I’ll provide the steel Don’t be helpless I’d love to test my blades on live heads for a real good cause! That would be one heckuva knife test, Sean. 😉 I wish we could stop these charlatans but the Internet and phone lines are basically wild frontiers that cannot be regulated against in such instances. We figure that at least if we warn people, hopefully those who read our site and BLADE newsletter will see it. Other than that we are powerless to regulate the Internet and phone lines. I guess that’s one of the many downsides of both means of communication. Then again, without those means of communication, we’d really be up the creek, eh? Have a good one and keep making those fine knives! Wow. I can’t believe people actually try to impersonate you guys, what a joke. Agreed–and it’s been going on for years, too. We get emails from the world’s top makers who exhibit at the show telling us about getting emails and phone calls from all kinds of scammers. And we’re pretty much helpless to stop the scammers from doing it, too. The Internet and phone lines are pretty much uncontrollable in that regard. I’m guessing this kind of thing is a problem for many organizations that run big consumer and trade shows and other events that draw lots of people to a city or area.